Alright, my hiatus from the blog is finally over! The combo of moving to New York and starting a new job has me a tad preoccupied to say the very least. That, coupled with traveling back from New York and California twice already in the span of six weeks for trainings and conferences = Tired Shelly! So, to continue on where I left off in my blog, today I present to you.... Day Five of my Seven 7×7 Restaurants in Seven Days series! 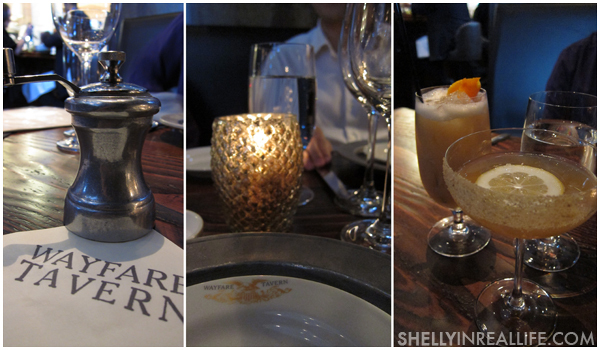 I'm more than happy to kick off the end of this hiatus with Chef Tyler Florence's flagship restaurant,Wayfare Tavern! Out of all of the 7x7 Restaurants that I've tried, I can say without any reservation that my meal at Wayfare Tavern was my favorite and I highly recommend that everyone goes and try these classic American dishes. 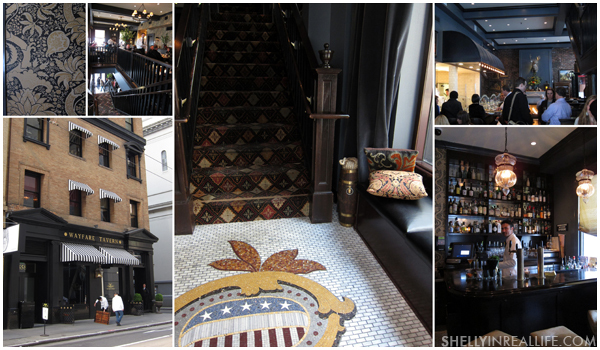 I love how Wayfare Tavern just looks like it belongs in downtown San Francisco as it would have in the early 1900's. Everything from the outdoor facade to the interior decor to even the tiniest details like a classic pepper grinder and silver plates used as place settings, ties in to their theme of a "Turn of the Century Tavern". I sat on the lower floor of this two story restaurant which features a cute fireplace as well as an open kitchen. 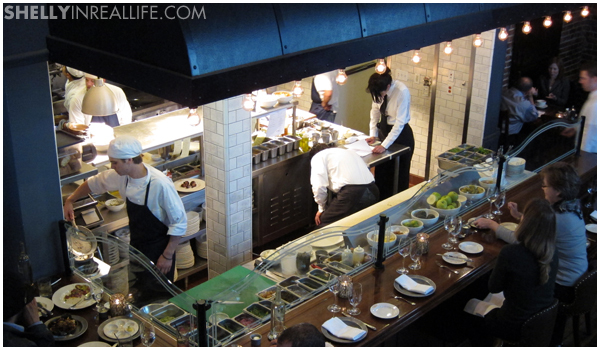 It was really fun to watch these chefs work together so efficiently! So the fun part about Wayfare Tavern, is that their coveted item featured on the 7x7 list is actually complementary with every meal, their popovers! So what's so special about these popovers? Honestly, I don't know. By itself, it seems a bit bland to me, maybe it's fun to break into it to see that it's hollow inside. 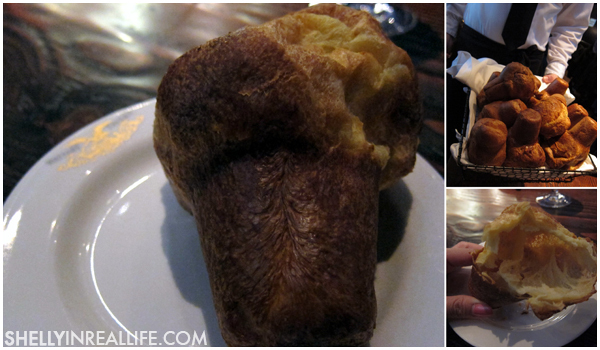 However, these popovers combined with the appetizers that I ordered were absolutely delightful. Tyler Florence's restaurant features seasonal menus to not only take advantage of the freshest ingredients available, but they also play to the theme of classic seasonal American dishes. When I came here, they were serving the Winter 2010 Menu. I was lucky enough to share this amazing meal with my brother and my foodie cousin, so we could all do family style and tried a bunch of stuff! Each of these spreadable appetizers were amazing. My fellow foodie pointed out that Wayfare chose a different type of carb to serve along with each of these appetizers, so the breads were all chosen based on the texture of the appetizer. I really appreciated this detail! 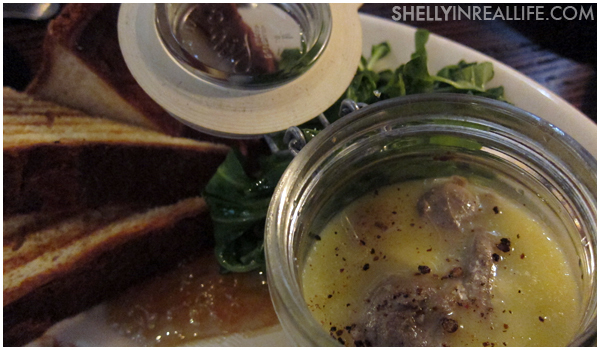 Chicken Liver Mousse in a Jar, Seasonal, $14 - I would say that the Chicken Liver Pâté was my favorite. 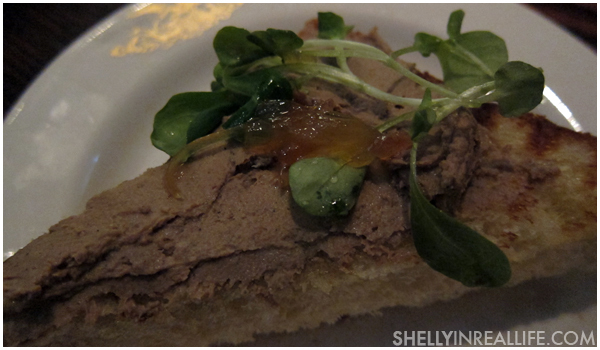 It was served with a lovely fruit jam, and the combination of the savory pâté and the sweet jam really did it for me. 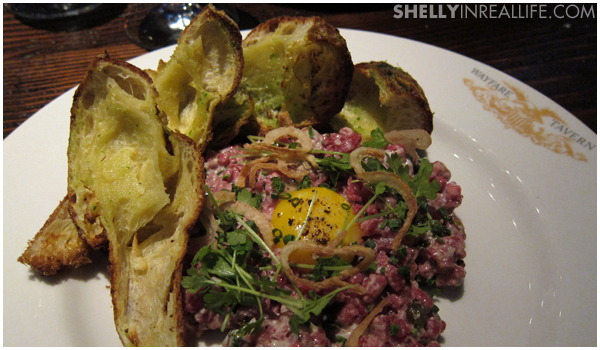 Steak Tartare, $16 - The flavoring for this was just the right amount of tanginess, I loved the egg yolk in the middle that you had to break to bind everything together, however, I wasn't the hugest fan of the texture. This is just my personal preference so I would say that Steak Tartare is a lot like Spicy Tuna Rolls at a Japanese restaurant. Some restaurants would cube it, and some would turn it into a mush. I prefer mine cubed so that there's something to chew on and that's not how it was prepared here. But, definitely not a deal breaker. Roasted Bone Marrow, Seasonal, $14 - amazing. I have nothing bad to say about it, but as I was chatting with my foodie about it, it just seems like it took the least amount of effort to prepare, and it's something that can easily be done at home. Not to say that Wayfare doesn't offer a generous portion or a unique cut of it, it looks like you're nom-ing on a huge dinosaur bone!! 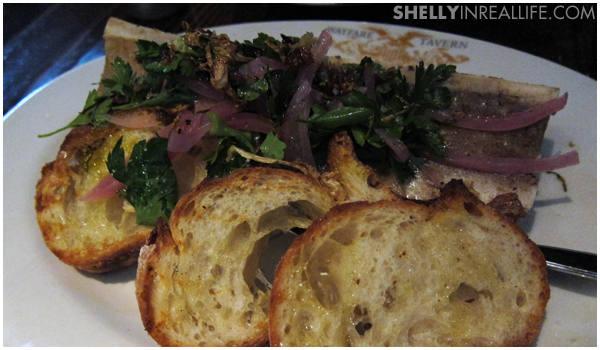 And, the parsley onion salad that they serve with it definitely helps cut down on the richness of the bone marrow. 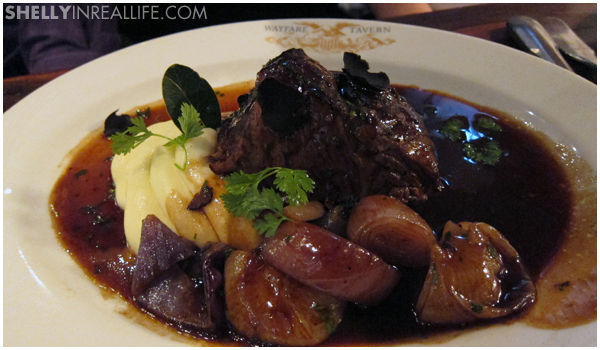 48 Hour Braised Short Rib, Whipped Potatoes, Truffled Onion Confit, Veal Jus, $27 - Need I say more? The 48 Hour Braised Short Rib was fork-tender and tastes like everything you wished your mom's pot roast would taste like, but a million times better. Sorry Mom. 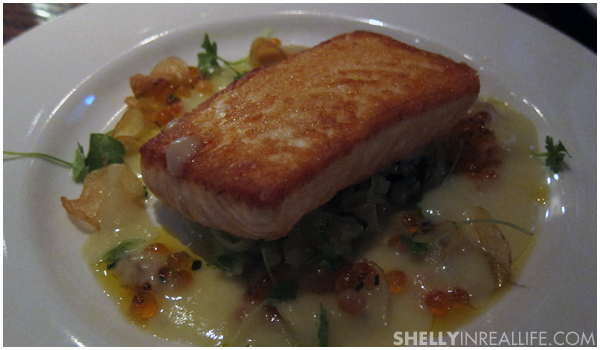 Seared Salmon with Buttered Braised Leeks, Yakon Chips, Thyme Infused Potato Soup, Smoked Salmon Roe, Crème Fraiche and Celery, $28 - perfectly seared with a crispy exterior and cooked just long enough so that it's still a tiny bit rare once the fork hits. 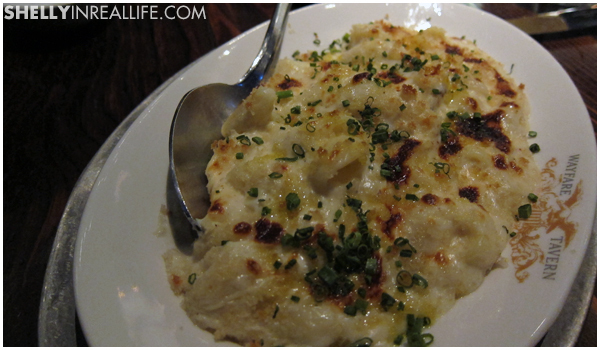 Jack Cheese, Garlic Bread Crumbs, Chives, Smoked Olive Oil, $8 - Their mac & cheese was way too thick for me, so I wasn't a fan. I was the least impressed with this side, but others seemed to love how cheesy and thick it is. Just not for me. Okay, after this huge meal, there was NO room for dessert for me... but here is what they did serve us... 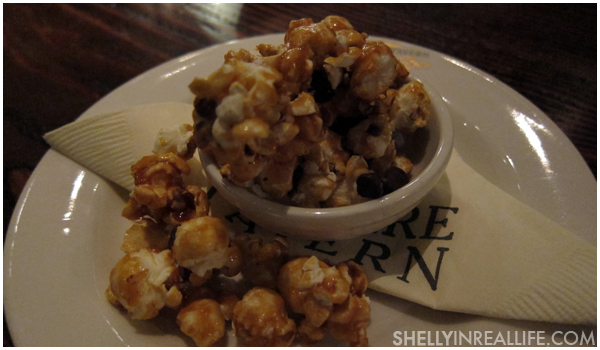 Warm Caramel Popcorn with Dark Chocolate Chips, a perfect little snack to end the amazing meal. Thank you Tyler Florence, I will have to come visit another one of your restaurants again soon!